Archeologists recently discovered a network of vertical shafts at the site which led to tunnels and tombs containing 40 mummies "believed to be part of the noble elite." 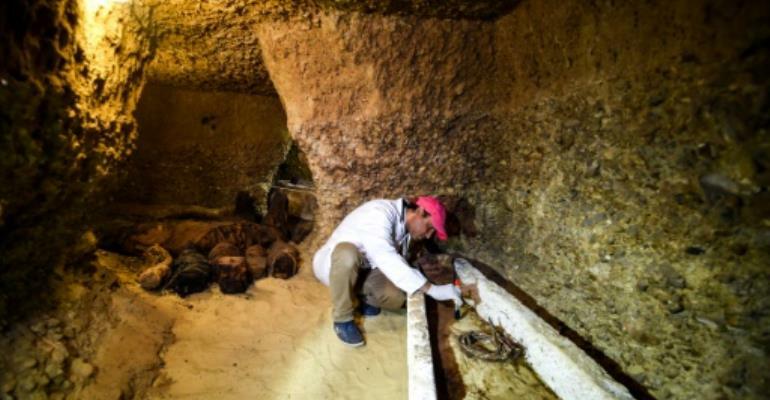 After exploring other tombs -- finding artifacts like statues, amulets, canopic jars used to store organs, and other mummies including one that had decomposed to a skeleton -- they crawled to the chamber containing the intricately carved sarcophagus. "It's a media spectacle in the end -- but it could make people love antiquities and is a good promotional opportunity for tourism, if done right," an Egyptian archeologist who asked to remain anonymous told AFP. Discovery's broadcast also comes with global interest in Egyptian archeology generated by a "once in a generation" exhibition about the pharaoh Tutankhamun, which opened in Paris last month and will tour the world.